Building super strong “Aussie Tough” sheds since 1952! My name is Alison Halupka and, together with my husband Danny, we are the owners of GRANT SHEDS. It was my father Grant Telfer who started GRANT SHEDS way back in 1952 when he was only 20 years old. He was keen on welding and working with steel and found a market making steel framed sheds. Through his focus on supplying strong, well-made sheds and his ability to listen to and understand what people really wanted and needed, his business grew quickly. He had very strong family and business values that were appreciated by his customers in the areas he supplied and built sheds in. Many people actually remember Grant for the 5 acre Adventure Playground he built in Monash SA (here’s an older picture I found of the playground). So many families had fun on the 200-plus pieces of playground equipment he added over the years. It was free to enter, all day, every day. 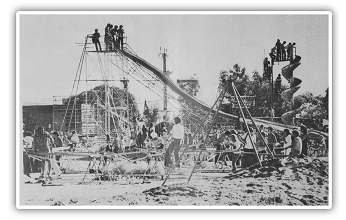 It had slides (including 3 that were on a 45-foot tower), more than 30 different types of seesaws, flying foxes and even basic roller coasters. It attracted more than 300,000 people a year from right across SA and interstate. Sadly it had to close in the early 1990’s because insurance companies would no longer insure it. That was the start of the ‘litigation era’ and insurance companies saw playgrounds as high risk. Here’s a photo of Dad, proudly posing at the playground, happy as ever and renowned for his white overalls, bare feet and bike … he’s quite a character and ‘local legend’! Danny & I joined the family business about 30 years ago and Grant has taught us all about building good strong sheds and how to really listen to what our customer needs and how to give good, practical advice on the best sheds for each person. It’s also about the planning and the systems we put in place to make sure we can do what we say we’ll do and within the time we say we do it. Dad retired in the early 1980s and Danny and I now own the business. 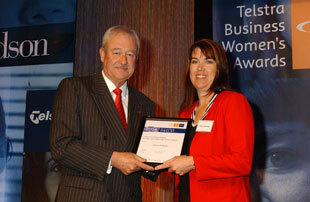 I’m proud to say that our efforts haven’t gone unnoticed – I was awarded the Riverland Women In Business Award in 2004 and was a finalist that year for the SA Telstra Business Women Awards. I tell you that not to brag or boast in any way, but instead so you know a bit about our history. Not just in supplying super strong, “Aussie Tough” sheds, but also to show you that we really do love to give back to our community and are proud of our caring, helpful and friendly attitude. We now have a 3rd generation of family involved in the business, with our son Brenton and daughter Melanie working here too. You’re sure to speak with some of us when you call. Starting in 1952 means Grant Sheds has been around longer than Australian television, and longer even than the famous “Happy Little Vegemites” song. Firstly, we’ve worked out by now what are the best sheds, designs and materials to suit Australian conditions. We even know what suits each of the Australian regions. Secondly, our company knows how to deliver the best shed to you – super strong and “Aussie Tough” – so that everything goes as smoothly as it can. From the sturdy materials to the impressive way it’s finished off … we know you’ll love our sheds. So for Garages, Farm Sheds (Machinery Sheds, Hay Sheds , Bulk Grain Sheds and Fertiliser Sheds) and Industrial Sheds that you’ll be so proud to own, please contact us and we’ll be really happy to help you. 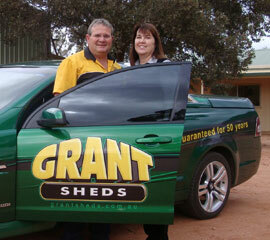 Click here to hear what others say about their experience working with Grant Sheds. EMAIL: Click here to email a message to us. Give us your contact details and some information about the type of shed you need, and we’ll get back in contact with you to discuss your needs further &/or give you some proposals. Or Keep viewing our web site and contact us when you’re ready.